The Copernicus Sentinel-1B satellite takes us over central Italy. 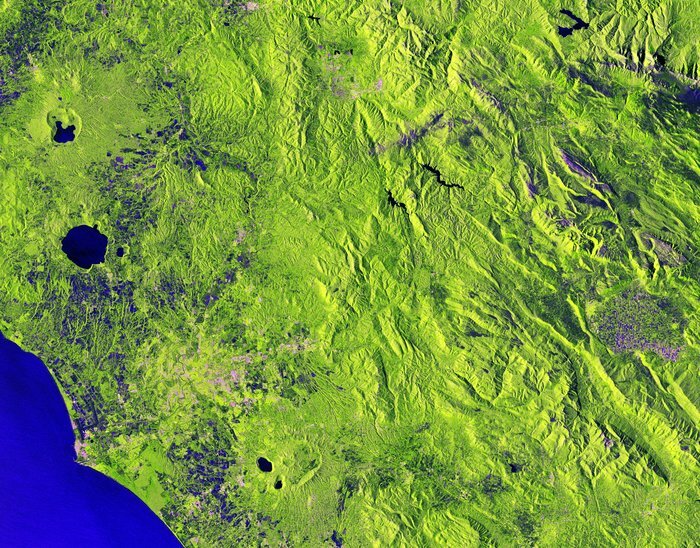 From the Apennine Mountains in the top right, to the fertile, former lakebed of the Avezzano plain in the centre right, this bright, false-colour image captures the diversity and beauty of the region’s landscapes. Dual-polarisation radar technology has been used, resulting in vibrant shades of green for most of the land surface shown. Built up areas, such as Italy’s capital city of Rome, appear in shades of red and pink. Meanwhile, the structure of the agricultural fields of Altopiano in the Abruzzo region is clearly reflected in a combination of blue and violet hues. This radar technology allows us to see the crater lake structures of the volcanic lakes of Nemi and Albano in the bottom left clearly. The same is true for Lago di Vico with the volcano and crater clearly visible in the top left of the image.